Southerners love their Coca Cola Chocolate Cake! Marshmallows and soda pop may seem like odd ingredients to use in a cake, but in the South, they are the real thing. This moist and rich chocolate sheet cake is a regular staple for social gatherings and celebrations. 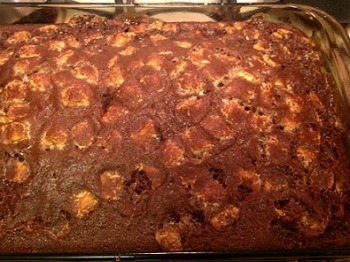 The addition of the cola adds an additional sweetness and the carbonation adds an airiness to the texture of the cake. Since I love all things chocolate, I was ready to dive in head first to try this cake. The traditional recipes for Coca Cola cakes that I found, use marshmallows and an icing that is supposed to be spread on the hot cake straight out of the oven. The icing partially melts into the hot cake to help create the sticky texture. I found this cake easy to make and after enjoying my first piece, I can definitely see why Southerners love this chocolate, gooey goodness! In the deep South, drinking Coca-Cola soda pop is a religion. It is such a staple in the Southern culture that most Southerners refer to Coca-Cola and all soda pop for that matter as just “Coke.” Because of this Coca-Cola love, it seems natural that the Coca-Cola cake also finds its origins in the south. It is very common to go to a church social or family reunion and find a Coca-Cola sheet cake on the dessert section of the buffet table. It is unclear to researchers if Coca-Cola cake was a created in a home kitchen or a clever way for The Coca-Cola Company to market their soda. Historians have found newspaper articles to confirm that using cola in cake recipes originated in the Southern United States. The earliest reference to a Coca-Cola Cake recipe appears in 1950’s Cookbooks and was brought to the forefront again in the 1990’s. 1997 – Cracker Barrel Old Country Store, founded in the south, was looking for ways to further incorporate Coca-Cola into their menu. They came across the classic Coca-Cola cake recipe, increased the cocoa ratio and reintroduced it as Double Chocolate Fudge Coca-Cola Cake. They decided to offer this dessert for limited periods on their menu. The cake became so popular with customers that Cracker Barrel would continue to receive requests, letters and phone calls asking for the cake to be on the regular menu all year. Finally in 2009, Cracker Barrel made the Double Chocolate Fudge Coca-Cola cake a permanent menu item and it has become their signature dessert. When you mention Cracker Barrel, people strongly associate the Coca-Cola Cake. * For buttermilk substitute: In liquid measuring cup, add 1 tablespoon of lemon juice or white vinegar, pour in milk to the 1 cup line. Let stand for 5 minutes then use the amount you need for your recipe. Preheat oven to 350 degrees F. Lightly oil and dust with flour a 13- x 9-inch baking pan. In a small bowl, combine coca-cola soda, buttermilk and vanilla extract; set aside. In medium-sized bowl, sift together the flour, cocoa powder, and baking soda; set aside. In large bowl, on low speed, beat together the butter and sugar until combined. Add eggs, one at a time, and beat until blended. Starting with the flour mixture, beat in a little at a time alternating with the Coca-Cola mixture until you have ended with the flour mixture. Continue to beat for 2 additional minutes until the batter is light and fluffy. Stir in the marshmallows. Pour the cake batter into the prepared baking dish. 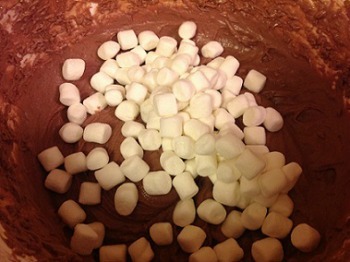 It is normal for the marshmallows to float to the top of the cake batter when cooking. Bake approximately 30 to 35 minutes, rotating the pan halfway through the cooking (once you reach 30 minutes, check cake every few minutes until done). Cake is done when a toothpick inserted in the center of the cakes comes out clean or when the internal temperature registers approximately 205 to 209 degrees F. on your cooking thermometer. 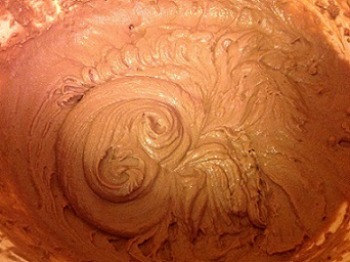 While the cake is baking, prepare the Coca Cola Chocolate Icing. Do not make the frosting in advance, as you you need to pour it over the cake shortly after baking. Remove cake from the oven to a cooling rack. While the cake is still hot, pour the prepared Chocolate Icing over cake and spread evenly to cover the cake. Let cake cool completely before serving. Serve alone or accompanied by vanilla ice cream. Topping Suggestion: Coarsely-chopped Pecans sprinkled on top of chocolate icing (optional). In a large saucepan over medium heat, stir together the butter, Coca-Cola soda, and cocoa powder until butter has melted. Whisk in the powder sugar, one cup at a time, and then add the vanilla extract. Stir until icing is smooth. 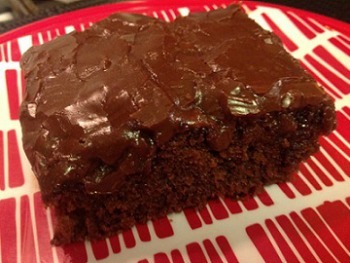 I slightly adapted this Coca-Cola cake recipe featured on the Coca-Cola Company website. Recipe contributed by Lee Avery Catts to Atlanta Cooknotes, published by The Junior League of Atlanta. What’s cooking America I love these recipes!! Thank you for sharing them! I followed this recipe exactly. However, during the icing prep, this recipe neglects to tell you to remove the combined ingred from heat before adding the powdered sugar. Critical step, or else the icing is liquid thin. The instructions are correct to add the powdered sugar while still overheat. Once the icing is finished it will thicken as it cools.